If you’re in a leadership position of any kind, you owe it to yourself and your organization to attend June’s Council Connect, Faster, Cheaper, Better the Agile/Lean Way. During this information-packed luncheon at The Gladly, Agile pioneer Dimitri Ponomareff will show you exactly how your business will benefit from adopting Agile and Lean methodologies. Contrary to what you may believe, Agile is not just for manufacturing, IT or software development; Agile methodologies can transform any business regardless of size or industry. Agile is a way of thinking and operating that eliminates wasteful activities, streamlines your processes and helps your teams thrive as cohesive units. Agile gets everyone focused on the right tasks so your organization becomes highly efficient, highly productive and highly profitable. This is an offer Torak has never made before and we sincerely hope every attendee takes them up on it! 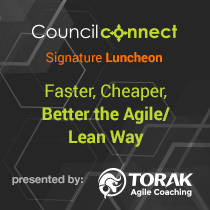 We encourage you to join us on June 15th at The Gladly for a lovely lunch and a power-packed presentation by Agile pioneer and President of Torak, Inc., Dimitri Ponomareff. Interested in attending? Find out more information and register here.